We have a whole lot of "smart people" sitting on our school board. Between them all, we have a Mechanical Engineer with a BS in Chemistry, a CPA, a BA in Speech Communications, an MBA and a Pharmacist. All very educated, yet none can seem to figure out why the bond didn't pass. Honestly, though, I don't believe they are really as stumped as they want us to believe. Pride and stubbornness are the true drivers of their head-scratching. They refuse to admit they have created a trust and respect issue when it comes to the "generous" taxpayers of the Everett School District. For a generation, we have freely opened our wallets and given them what they wanted, trusting that they would do what was best for our kids. But, suddenly, they took us for granted and, without asking us and with a whole lot of closed doors and inconvenient meetings, they used money meant for kids to take care of themselves. Now WE are the problem. We have "misconceptions". We don't understand. We don't know how hard the old administration buildings were to deal with. Because, if we really DID understand all that, we would have gladly let our children continue to crowd into portables and break legs on grass fields and welcomed the new "Community Resource Center" with applause and adoration. No one that I have run into doesn't think there are needs in the district. Many people RELUCTANTLY voted "No". But, they did because this is an issue of TRUST and RESPECT. It has very little to do with ignorance of needs in our schools. This isn't a response to the poor economy because, frankly, we passed a levy in 2010 just fine. This about a loss of the public's trust and a disrespect toward the public by the board and superintendent that has been brewing for several years - end of story. Now, that we've cleared up THEIR misconception, here's what they should do in an easy-to-read bullet list. I can pretty much promise that if the school board took these steps in a very public manner and with sincerity, that the next vote would swing their way. Talk to the public: No, don't get a little group together at Rotary that consists of all the usual "community leader" last names like Rodland, Shockey, etc. Your community leader friends are just ONE part of the "public", and, frankly, don't impress many of the rest of us. Go to the PTA meetings and the Boys and Girls Club, and the Senior Centers. Set up an information booth at the concerts and the school sporting events and LISTEN more than you talk. Honestly, most of us with kids in school aren't found at community clubs. We are too busy driving our kids around and making sure they've done their homework. Heck, start a Facebook page that isn't just a string of propaganda but invites people to talk to you and bring their concerns to you. This district is extremely "scripted". It's time to just TALK and stop trying to control every conversation. Other districts around us are doing it. Open your door: That ridiculously inconvenient 4:30 meeting time does more damage to the school board's reputation than they want to admit. During the campaign, Carol Andrews very flippantly said that she'd consider changing that meeting time IF you could show her how it would change "one child's test score". That statement still burns my ears. How completely disrespectful to the very public she's elected to represent. Well, I believe making public meetings more convenient to the public CAN change test scores. A lot of research shows that when a parent is involved in their child's education, the child does better. When a parent attends a school board meeting, they learn about the workings of the schools. How is that ever a bad thing? We are literally the only district in the area that insists on holding school board meetings at such an inconvenient time. It's clearly designed to keep the public at bay. It's a simple change but they embrace that time with stubbornness for no valid reason other than their OWN convenience. The message to the public is pretty clear - it's about US, not you. Change the language in the new bond proposal to be binding: If we knew that they could and would NEVER do an Administration Building-type move to the public again without our consent, it would change everything. Rodman has a suggested change of language HERE. The school board is fighting too hard to justify the righteousness of their decision to build the Administration Building. But, you know what? If the cause was so righteous and MORE necessary than, say, a remodel of North Middle School, then they should have made that case to the taxpayers and let US decide. But, we didn't get that respect. Sadly, we didn't forget it either, as they hoped we would. 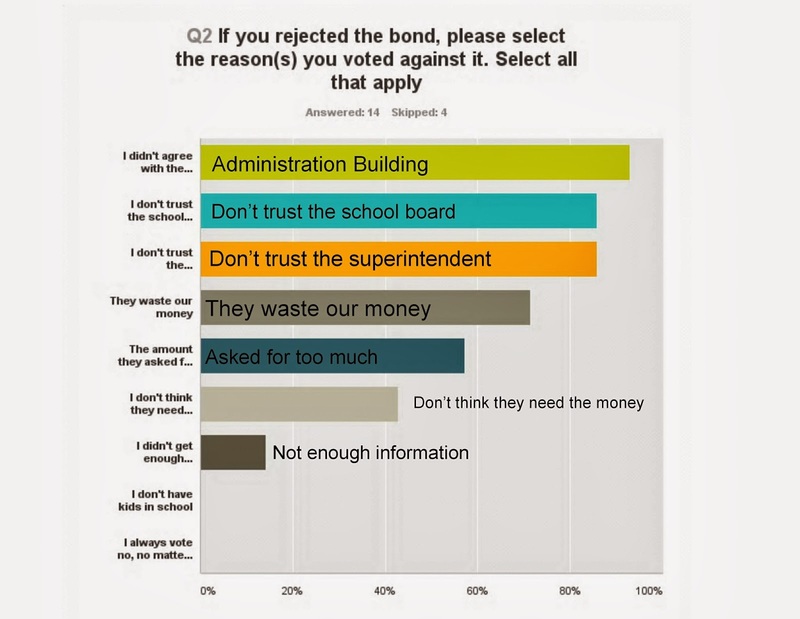 Ditch the platitudes: So little actual information was presented on the pro-bond website. They are asking for an investment of a quarter of a billion dollars. You don't convince investors to give you money by telling them it's "for the kids" and "the right thing to do" and to ignore what you've done in the past. I, personally, found their campaign light on facts and heavy on emotional blackmail. But, school districts are used to doing only that. That's why they do everything they can to NOT hold these special votes during regular elections. They would be obligated to present Pro/Con positions in a voter's pamphlet. When one is not printed by the county, they only need to present the rosy side of the situation and hope the masses are really too ignorant or forgetful to mess up their plans. If they HONESTLY wanted to encourage as many taxpayers to participate as possible, they'd hold these things alongside an August Primary or a November General Election. But, that's when the voter's pamphlets are printed.... So, outside of that idea, how about they make a REAL website with deeper levels information on it or hold Town Hall-style meetings where people can openly speak about their concerns and ask questions? There you have it. In four simple steps, this nearly brand-new School Board, can set a new tone of openness and respect and start re-building the public trust which was lost. It's not rocket science and doesn't take an advanced degree to figure out the situation. It just takes some humility and a willingness to stop acting like Community Leaders and start acting like Public Servants.